He joined the Merchant Navy as an apprentice with Manchester Liners in 1916, at a salary of £2 10s per year. He regarded himself lucky that he was only on two ships that were torpedoed. He was, however, in Halifax harbour, Canada, on 6 December 1917 when there was a devastating explosion, the result of a collision involving a munitions ship carrying benzene and TNT. 2000 people were killed, around 9000 more were injured, and the resultant tidal wave stranded hundreds of ships and smaller craft on the beaches. He was in Arkhangel, Russia in 1917 when the Revolution began. On returning home in 1919 he couldn't find work so he borrowed £100 to buy a Model T Ford one ton truck with an interchangeable body and set up in businesses for himself. During the week he hauled coal from Stott's Pit, Westhoughton, for bagging and delivery around Horwich and at weekends the same truck became a charabanc, running trips to seaside, football matches etc. He pioneered pensioners coach tours to most seaside resorts. This entailed the booking of hotels for the season, all of which he vetted. His brother, Jim, joined him in 1921 and by 1924 they bought a second coach and erected the first petrol pump outside Bolton at the Beehive pub. By the time the Second World War broke out they owned four coaches which were then used for "government service". Fairclough Brothers sold their Coal hauling business in 1946 and bought the Beehive Garage. With the coach business continuing to expand with new coaches every few years, both businesses were finally sold in February 1966. Chairman of the Housing, Town Planning and Estates Committee. He inaugurated the first Horwich Civic Ball which was held at the Mechanics Institute on Chorley New Road on 25 January 1956. He served on the Divisional Education Executive, was a Governor of Rivington and Blackrod Grammar School and was a Governor and Vice-Chairman of Horwich College of Further Education. 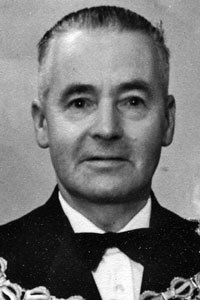 He enjoyed Rotary, joining the Horwich club in 1952. He was a Past President and acted as Conference Secretary for many years. He took a great interest in the welfare of senior citizens and regularly drove the Meals on Wheels van which was provided by the Rotary Club. Having started life as a 'top sider' (the top side of Horwich), he returned to the 'top side' on his retirement. His garden was 575 feet above sea level and this took up most of his leisure time, rearing his own plants and growing potatoes and tomatoes as a sideline. He also enjoyed walking, foreign travel and photography. 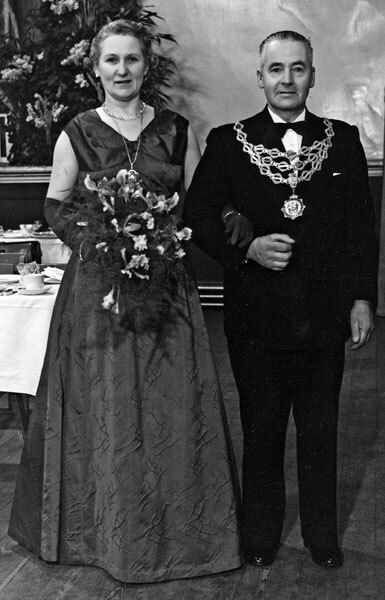 Formal portrait of James Fairclough and his wife at the first Horwich Civic Ball 25 January 1956..